You're worried that I have a drinking problem, right? I do have a drinking problem, drinking half and half. I bought a quart of half and half Saturday afternoon just to be sure that I had enough to make these to bring to Ska's for the Bears game, then DRANK HALF, I mean, with my partner in crime, half in this amazing french toast crunch and half in hot chocolate that I made with half and half, almond milk (you know, to lighten it), and a bar of chocolate, and on Sunday morning there wasn't enough. This is a party-size amount, but the basic recipe is equal parts pumpkin butter, half and half, and vodka. Although! I originally made this with whipped cream vodka and it was good, but I didn't think it had to be so sweet. So for Ska's I made it with plain vodka and I liked that better, but I think that sweetened vodka has a lower ABV than plain? Or it's so sweet you can't taste it? Anyway these were real strong, so you may like to adjust to taste. 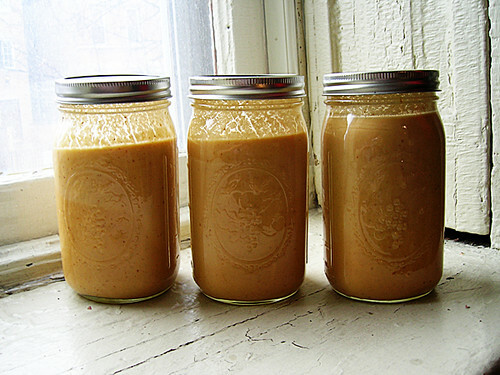 Whisk together the pumpkin butter, half and half, and vodka, and ladle into jars. To serve, pour into a glass and top with whipped cream.